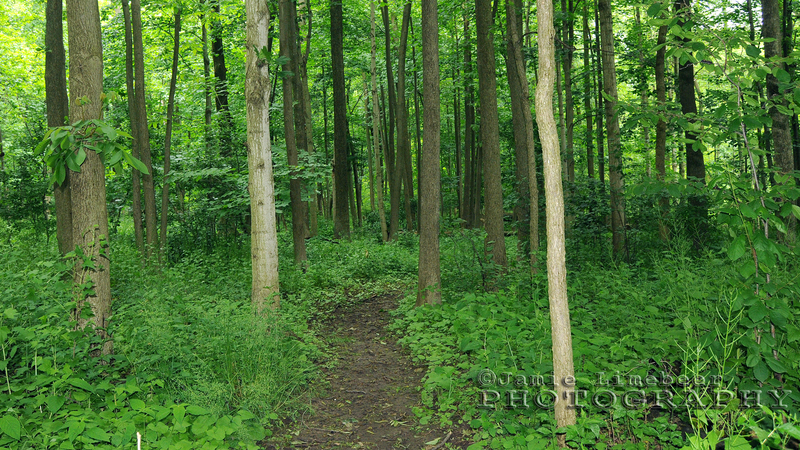 Located in South-West Ontario near the hamlet of Avon, Lake Whittaker Conservation Area is a nice wooded esacpe in the middle of farm country. The 26-acre lake supports a public beach, camping, fishing and several kilometres of hiking trails. The entrence to the conservation area is located at the end of Whittaker Lane. There is an $8.00 entry fee (per vehical) to gain access for the day. Once you're all paid up turn left around the gatehouse and follow the road along the south side of the lake to the day-use parking area (GPS Location: N 42 54.720 W080 57.587). The two trails will take you on a 5 kilometre (3 km of hiking trail, 2 km of road) loop of the lake. From the day-use parking lot, walk the wooded trail and end up at the public beach in the camping area. From the beach, back to the parking area, walk along the road. Starting at the day-use parking lot, head towards the lake and through the gate. Welcome to Sinking Bridge Trail. The first few hundred metres of the path are quite simple... it's wide, grass covered and quite flat. Make sure you check out the fishing piers to the right as they give you a great view of the lake. Also along this stretch is a nice pinic area with lots of tables, this is a great spot to sit and relax after the hike. After a few minutes you'll arrive at the end of a road and the trail will make a sharp right and down a hill. 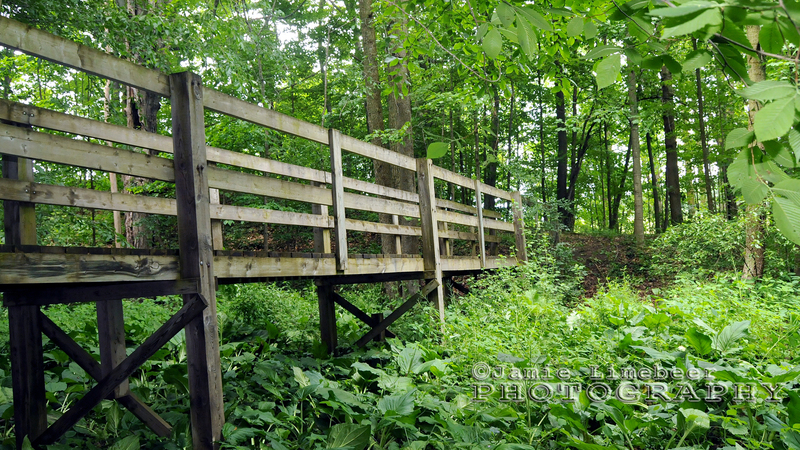 This part of the trail is actually the old allignment of the road and at the bottom of the hill was an old floating bridge that crossed the wetlands. Now this is where the trail starts getting a little more difficult. Before reaching to bottom of the hill there is a small un-marked entrence to your left. It may not look like much but things open up after few minutes. 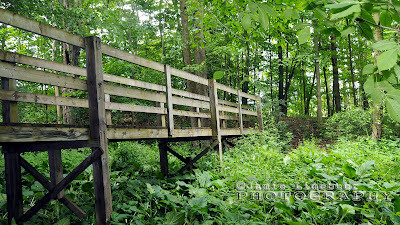 This part of the hike is takes you along some very interesting terrain as well as grassy meadows, over boardwalks and through old hard and soft-wood forests. By this point you've probably noticed that the trail is not marked that well (or at all) and the map available at the gate-house is not a good representation of the trail. 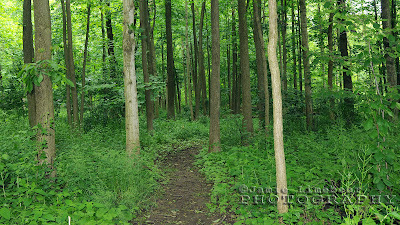 As you walk through this part of the woods you're probably wishing things were advertised a little better. Over the next few minutes you'll find many forks in the trail. From what I saw, most lead back to the main trail but use the attached map below to help you find your way. Continue along the route until you reach the old alignment of road again, this will mark the end of the Sinking Bridge Trail but not the end of the hike. 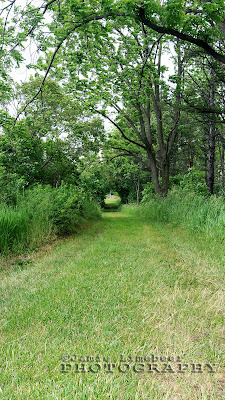 Follow the grassy road until you see a sign for the Ivan Row Trail and make a right into the second half. Ivan Row Trail is a little different then the Sinking Bridge Trail, it follows much closer to the the lake and can get quite muddy as you make your way through some marshlands. Though the trail is not marked (except for the entrance and exit) it is much easier to follow with no side trails to confuse you. As you near the campground section of the park the trail will turn into a mountain biking area with several jumps and hills. If you stay to the right you'll see the exit which brings you to the public beach and some washrooms. That marks the end of your hike. To get back to the day-use parking lot follow the road to your east, past to the gatehouse and along the south of the lake. 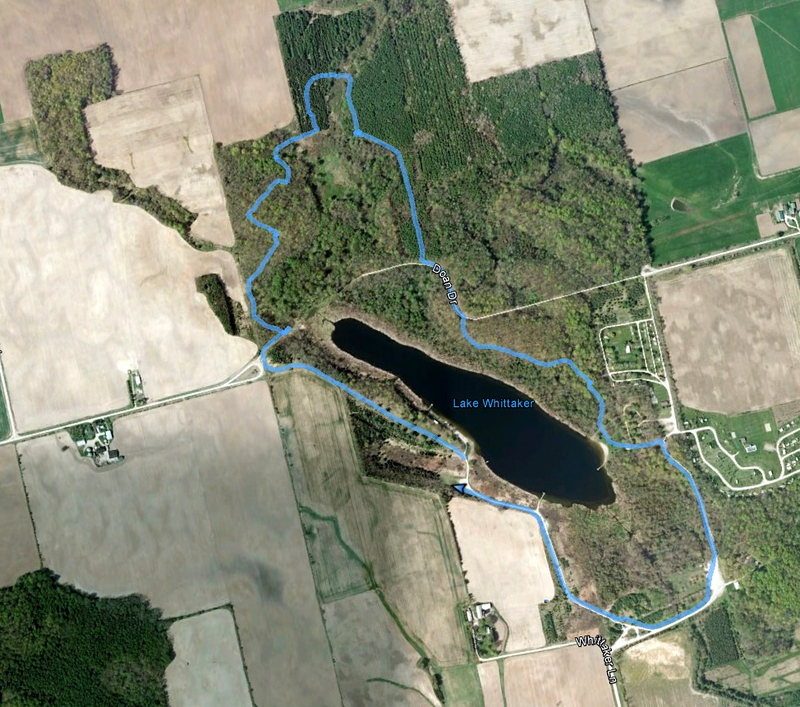 Lake Whittaker Conservation Area is a great spot to spend an afternoon. The trails allow you too see a rare part of Southern Ontario. The only negative is the lack of signage along the trail but the scenery by far makes up for this. Enjoy. Thanks for this. Perfect! I'm going camping here next weekend and I've been having a hard time finding any kind of detailed info at all. This is the best description of the trail and map I've come across!